Another 5K this chilly February morning….the Polar Bear Run! Twenty-five degrees is COLD anywhere, but not too often does it dip this low in Georgia. 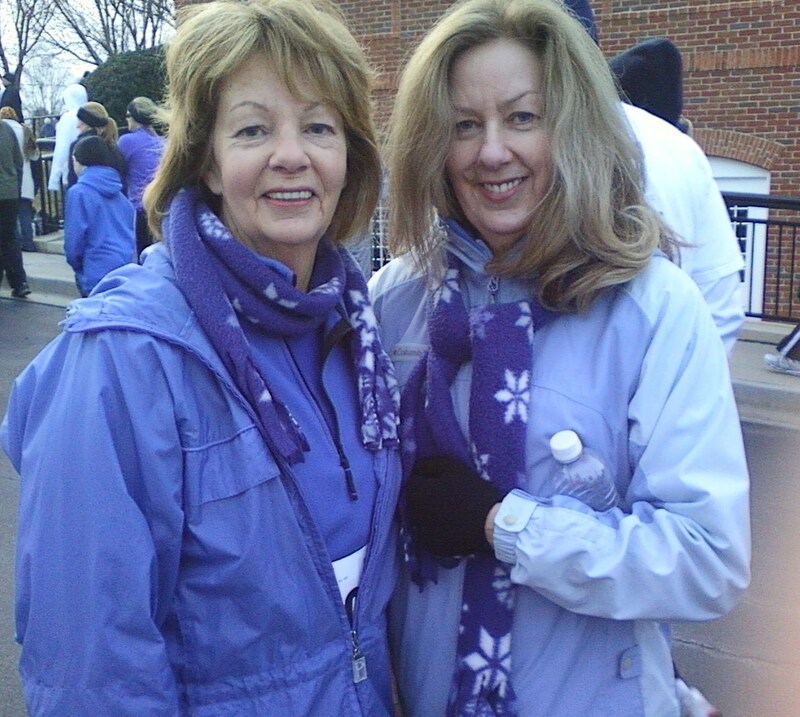 “What’ll we wear to run in below-freezing weather?” my sister Karen and I whine. This is our fourth race. We’re feeling more confident being members of the "runner world." We know the routine of checking in, warming up, pacing ourselves. We really just want the motivation, the camaraderie of other folks in our over-50 age group. We layer up and wear hats, scarves and gloves. However, our toasty Nanook of the North style clashes with everyone else’s body-hugging, fashionable-looking warm clothes. A few minutes into the race, our pace slows as we unzip, untie and take off our jackets. I stuff my gloves and Kleenex into pockets and sleeves, looking disheveled but able to move much faster now! After doing years of Zumba, yoga, morning runs and nature hikes together, we realized one day in 2009 we could easily do a 3.1 mile race….no problem. We saw a poster for a “Trail Run” at the local high school and excitedly sent in our $25 registration. The form asked for the usual information...including our ages, but we had no clue what our time/level/capability was. But we had to put something in the red-starred box; if we could sometimes run a 12-minute mile, should we put in 36 minutes? Did we want to seem fast and be in the front of the pack? Hell no. We rounded it to 40 minutes, hoping we’d be placed in the middle at least. But Karen and I really had no idea what we wanted, or what we were getting into. No big deal we told each other….this will be fun! We can do this! As we parked in back of the school, we noticed the crowd gathering in a weed-high field. Yikes! We nonchalantly wound our way to the registration desk, careful not to trip over ruts and gnarled chunks of dead grass. Still acting cool, we held the shoe clip in one hand and our paper number in the other trying to figure out where and how to fasten them. As we pretended to stretch and compare numbers, two good-looking guys offered to lean down and “do our shoes.” My sister said “oh, that’s okay, we can do it” while I sputtered, “Oh, thank you so much. This is our first time”as Karen shot me daggers. Not only did they attach it, they explained how Chip Timers recorded our time. Next, they asked if we’d grabbed safety pins from the registration desk. Ahhhhh, no. “You mean there’s an electronic device on our shoes but we still use four safety pins to attach the race number?” I asked, sounding indignant. I ran back and grabbed some, getting a little nervous as the clock moved closer to the 8:00 start time. Meanwhile, my sister enjoyed the company of both young men who were using their "help the old first-timer" manners, I’m sure. 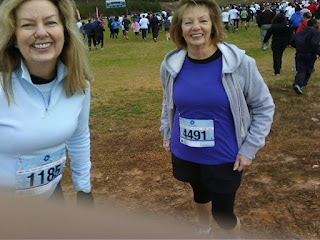 December, 2009; our first 5K...sorta! The warning horn sounded for runners to line up and we complied; taking each other’s picture to show our official race numbers. A friendly spectator took our photo together, commenting on how hard it was to run in woodsy terrain. Wait, what did that mean? And there we were….laughing and kidding around….just as the GO horn blew and the camera snapped us! It was only a matter of seconds, but as we turned around and realized what was happening it was surreal. Could we be any more obvious? We took off feeling foolish, very un-cool and totally discombobulated. We couldn’t believe we were expected to run on a rough, rocky, tangled trunk-rooted trail. These trails are to be hiked carefully we told other would-be runners…that’s why they make hiking boots. No one paid any attention as they hurried past us. Little did we know that a Trail Run meant a high level performance race for serious, experienced, win-the-medal-athletes. It was all in the fine print we discovered later. Everyone was swiftly passing us with their feet barely brushing the ground while we fretted about twisting an ankle. It was close to an hour and we knew we were way behind. Luckily we saw an escape route off to the side where family members were cheering. We hurried past them and headed straight to the car. Our heads may have hung in defeat and disappointment, but we burst into giggles as soon as we left the lot. It was the funniest thing ever. The picture says it all….and every time we tell the story we probably embellish it a bit. It was out first attempt, but not our last. We were hooked! A month later, we did the early morning New Year’s Day Race through constant drizzle; but this time it was held on paved, blocked-off streets. We were better prepared and motivated to get it done in 40-45 minutes. As usual, Karen finished ahead of me; I sometimes had to walk a few minutes. But we achieved our goal; less than an hour. 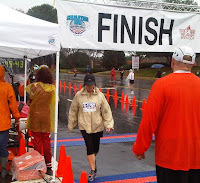 Chilled and drenched, I looked pretty unhappy just strolling across the finish line. But I must have run most of it, my time was 46 minutes. 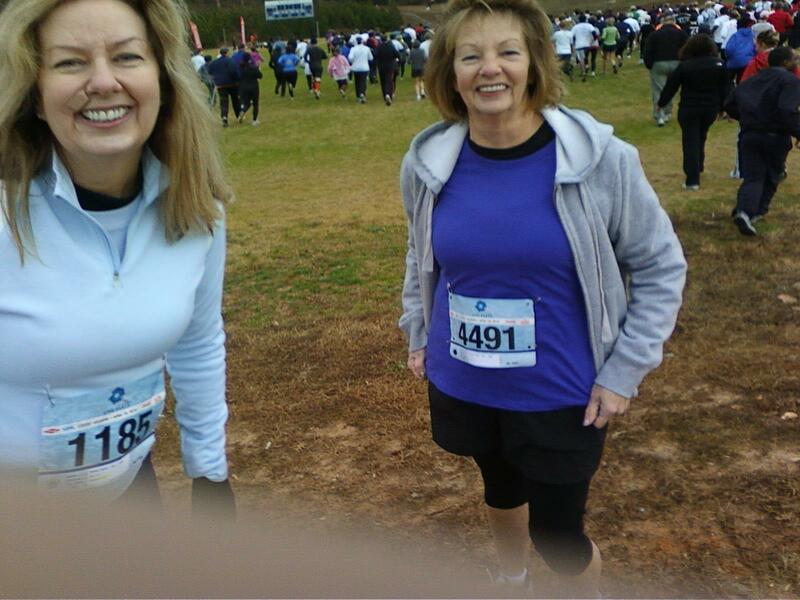 By spring we were motivated again and registered for a church-sponsored 5K. However, April in Georgia can be quite hot. And the route was NOT a blocked-off street; but a nearby residential neighborhood called Rolling Hills….or it should have been called that. Hot and hilly is not easy; I accepted the shuttle ride up a half-mile high hill. Because of my age…..which I’m sure the computer printout highlights in yellow…..race officials seemed to know whom to keep an eye on. But there were younger, out-of-breath people also on that shuttle. I told myself it was wise; I wanted to live another day to dance in Zumba class! Getting out and running downhill was a breeze and I clocked in at 47.31 minutes.....thanks to cheating. With a mix of sister rivalry and encouragement, we continued our outdoor and gym activities the rest of the year. Thirteen years younger, Karen says she wants to keep in shape like me as she grows along. In turn, she gets me to try new things. Kayaking, climbing Stone Mountain, swimming laps, weight training are things I might have missed if it wasn’t for her. 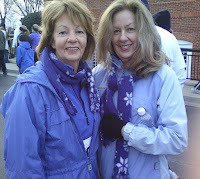 Although we walked, ran and rode our bikes frequently, we didn’t think about another race until the following February. We noted our times; but after awhile they weren’t that important. We liked bettering ourselves and the high we got from accomplishing something difficult. 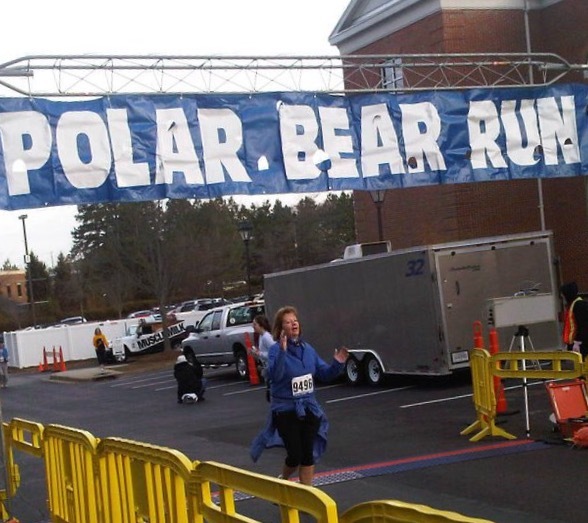 Shortly after the Polar Bear Race, we discussed Atlanta’s famous Peachtree Road Race! We looked up 10 kilometers and knew we could do 6.2 miles if we put our minds to it. There's a random drawing for this race and wouldn’t you know we were accepted. OMG…this was big time! Scary big-city-crowd big time! An eight-week training course was offered in our area, so every Saturday in May and June we ran/walked 6 miles with team leaders ahead and behind us. In June it can be 80 degrees first thing in the morning; that was the point….how to stay hydrated and pace ourselves in heat. We learned from speakers and videos and doctors as well as on different practice routes. Clocking it in my car one day, I couldn’t believe it….no one walks six miles to the mall, the new high school or the Greenway! One Saturday I just couldn't do it; worn out, I wanted to bail. I called my husband after four miles or so and asked him to come get me. He said no. I was probably in tears at that point, but forever grateful afterward that he said no. I soldiered on and made it back to the starting point! The Peachtree is held on the 4th of July. NO ONE goes downtown that day unless you’re in it…..or there to cheer someone on! Jim and my kids, my sister’s kids…..they all said “No thanks. Have fun, hope you survive!” There’s a steep climb along this race route referred to as Heartbreak Hill due to heart attacks over the years. Survival jokes aside, we’d practiced on hills and felt confident we could handle it. Karen finished before me again, but finishing within two hours was my goal and I did it in 1.54! I felt pretty proud as I realized there were still folks behind me with at least a mile to go before they’d sleep! "That’s it," we said. "We have done the Peachtree!" After 28 years in Georgia, we’d done the Peachtree. We didn’t need to spend another dime on a race when we could just walk around the parks and trails in our northern suburban community. With a family history of heart disease, we’d improved our strength and endurance as well as pleased our cardiologist! My sister, now the manager at a senior center and close with city leaders, coaxed me into doing one more 5K…the Mayor’s Race in the winter of 2013. Layered up and wearing the blue ‘lucky’ scarf my niece had made me, we arrived in the dark and drank free cups of coffee as we waited for a 7:00 start time. 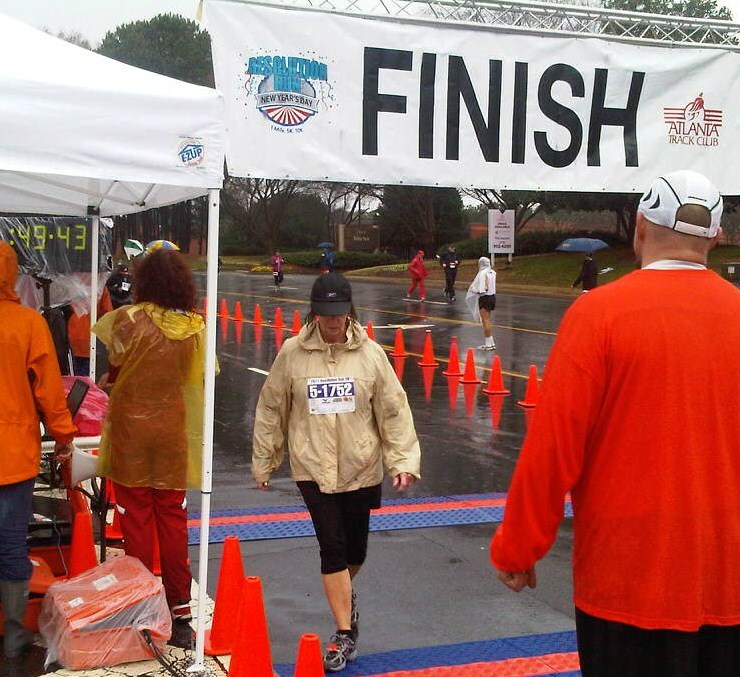 After the Peachtree, we’d lost the urge to RUN a whole damn race….jogging had become our gait of choice. Karen took off eagerly, and I waved her on ahead; deciding to just walk and breathe this time. I missed my loud, motivating music and wished I’d brought my ear buds along. This route was a tree-lined boulevard, down one side and up the other to the finish line. At about the 2.8 mile marker, I stopped, held onto a tree and did a few knee lifts to ease my tightening legs. A police cruiser stopped and the driver asked if I was okay. I assured him I was and jogged onward. But my left leg kept cramping and I worried about stumbling. As the officer drove by again, he stopped and waved me over. Oh God…so cute, so young, so sweet. “How about I give you a lift to the 3 mile marker, just before you turn the corner for that final push?” he winked. And so…..cheater that I am, I said okay. I got out of the police car and took off, one of the last to cross the line to applause and cheers. As soon as it was over, the mayor congratulated the participants and began announcing winners. Karen and I were talking and laughing in the back of the crowd as I told her about my new favorite policeman friend. She’d already greeted the mayor, so feeling tired and hungry, we decided to leave. “Joan Stommen!” said the voice over the loudspeaker. “Winner of The Over-65 Age Group; please come forward.” Karen was in stitches as I kept muttering “but I was last; I had a ride.” I received my first-ever medal and shook the mayor’s hand; all the while trying not to giggle. Turned out...at age 69...I was the ONLY one in my age group! True story; and I now have a medal that says First Place. After moving back to Michigan last summer, I unpacked everything and hung the medal on a hook alongside my scarves and belts. It spoke to me one day last winter and suddenly I wanted to do it again. I registered my two granddaughters, daughter-in-law and me for the Portage Winter Blast 5K. The three of them, excited about snow and cold after living on the beach in southern California for ten years, showed up to participate in this sport with Grandma. Teen girls and working moms like to sleep in on weekends, so I was touched. Maybe they came to support me and maybe I wanted to prove I could not only finish a three-mile jog/walk, but we could all have fun in cold weather. The 2017 Winter Blast is coming soon, but wouldn’t you know, I’ll be out of town. I think walking 3.1 miles in Florida sand with my girlfriends will be just about perfect! Good for you! I used to run daily and did a few 5K's (even one a turkey in the Turkey Trot at a local college once). Now I walk at a brisk pace. My daughter once asked if we were going for a walk or a forced march. It can be tricky to find a good walking partner. This made me tired. I need to reread it and get motivated instead. haha. Hooray Joan! Running 5Ks gives "You go girl" a whole new meaning doesn't it. I love this! I used to run. My youngest daughter and I participated in a couple of road races and had a blast! Didn't finish anywhere near the top but had so much fun. I hadn't thought of entering any races because my running days are over. Hmmm . . . maybe I should re-think . 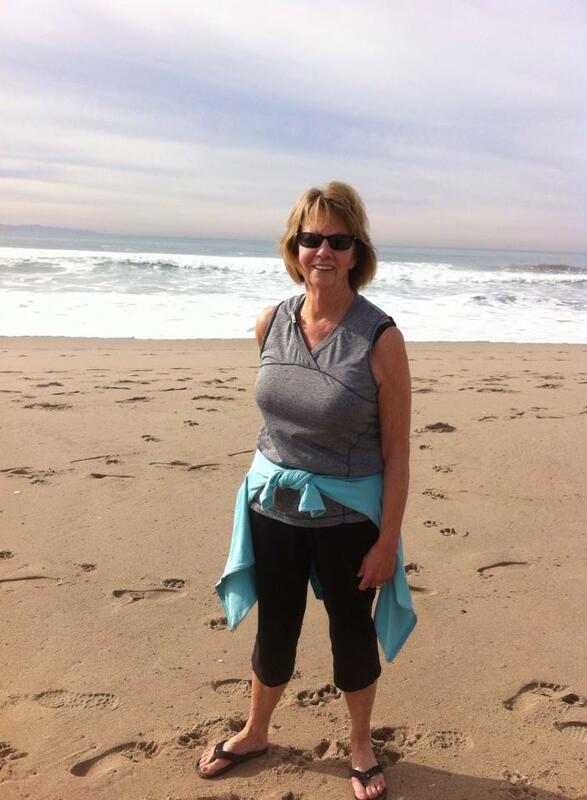 . .
Diane, many organizations offer a separate category for jogger/walkers and that's my style now. I think serious runners complained about folks walking abreast and chatting...and I'd agree. Since I just love the motivation and commitment to show up and finish...it's perfect now for almost 73! Good Job! We have to kick old age to the curb! Or at least let it know who is boss! Wow...running 5K in 25 degree weather! 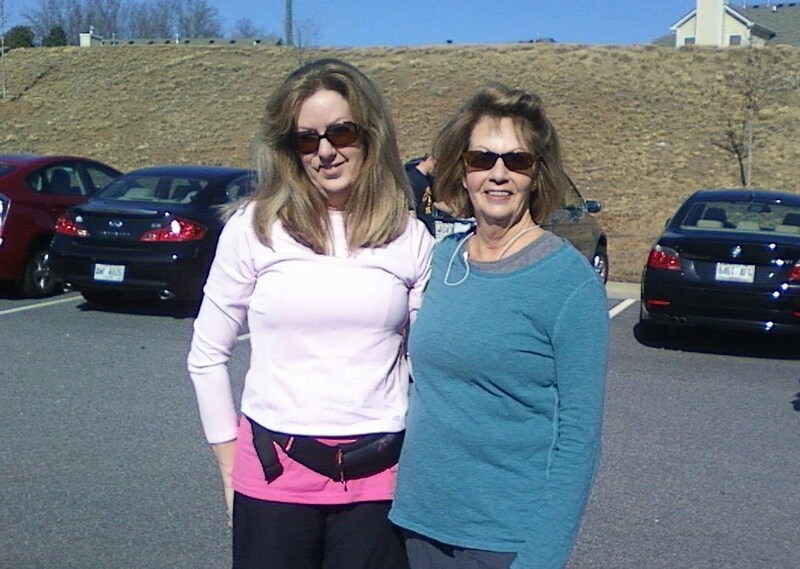 You ( and your sister Karen) are a great model for staying active over 40 50,60! I enjoy Zumba and nature hikes too, but I relocated to a new area in 2013 and could not find a regular zumba class I could attend. I LOVE the story of how you came to get the first place medal ( even though your cheated somewhat!). You are such an inspiration!! Thanks for reading, Darlene. I think you're quite inspirational yourself...stress relief is a big deal and elusive for many people. I'm glad I've found your site and can learn more ways to calm and pamper myself! I really enjoyed reading this. Good for you! We feel so much better when we are active. I like to try new things. Last year we went paddle boarding for the first time and this past fall I went on a 6-7 miles hike in an area that I didn't even know existed in Kansas - so pretty: rolling hills, water, trees, etc.